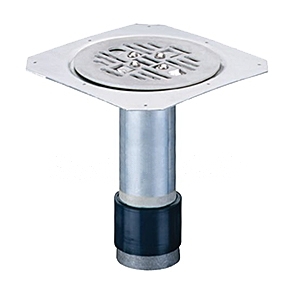 PRODUCT: BALCONY / WALK DECK RETROFIT DRAIN, FLAT, STEM FITS 4" ID DRAIN PIPE, 2-1/2" OPEN DRAIN AREA AT TOP WITH ROUND 6" FLAT STRAINER, 8X8" SQUARE FLAT FLANGE, 9" DRAIN STEM WITH EXPANDING SEAL. ALL ALUMINUM CONSTRUCTION. PRICE/DRAIN. Retrofit drain. Drain stem fits into a 4" ID pipe and seals using a screw tighted plug / rubber seal. * Pre-punched .080" thick with a 8”x8” aluminum seating flange. * 9" long drain stem assembly. * 6" diameter x .125” thick, removable aluminum drain / clamping ring. * Incorporates the patented Compression Seal. BALCONY / WALK DECK RETROFIT DRAIN, FLAT, STEM FITS 3 in. ID DRAIN PIPE, 2-1/2 in. OPEN DRAIN AREA AT TOP WITH ROUND 6 in. FLAT STRAINER, 8X8 in. SQUARE FLAT FLANGE, 9 in. DRAIN STEM WITH EXPANDING SEAL. ALL ALUMINUM CONSTRUCTION. PRICE/DRAIN.